The Ford Edge ST is the company's first performance model vehicle for its line of crossover SUVs. It offers drivers a sleek interior design, intelligent all-wheel drive and body lines designed with precision. This performance-driven ST gives you plenty of advanced features to choose from through Ford's Co-Pilot360 technology. 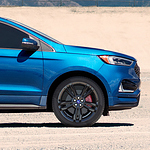 The Ford Edge ST crossover SUV basic package gives you intelligent all-wheel drive disconnect, post-collision braking, electric power-assisted steering and enhanced traction control. When it comes to performance, the ST definitely delivers. The standard model has a respectable 2.7L V6 EcoBoost engine with an eight-speed automatic transmission and auto-start-stop technology. The SUV also has a four-wheel drive anti-lock brake system with traction control. When you take a Ford Edge ST crossover SUV for a test drive today at Bob Thomas Ford West, take advantage of its 2.7L V6 EcoBoost engine so you can get a feel for how well this performance-driven vehicle handles.